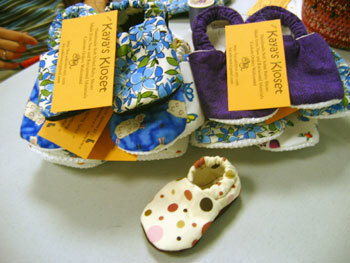 Lookie, Kaya's Kloset shoes are now available in the Booksmith card & gift room! Way to go Johanna! 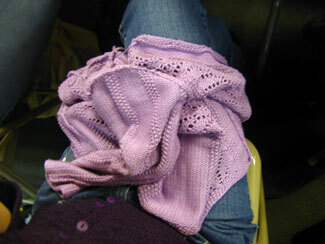 Johanna's pretty pretty ruffly heart cardigan for her daughter. 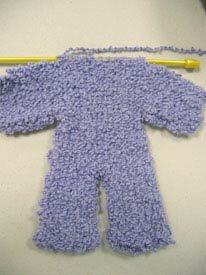 Pattern and yarn are both Sirdar. 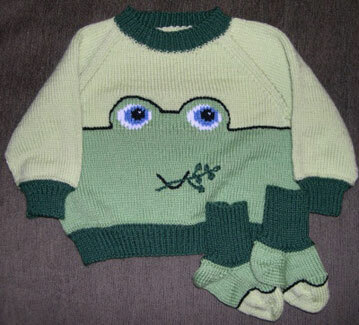 Can't beat that for kids' knits. 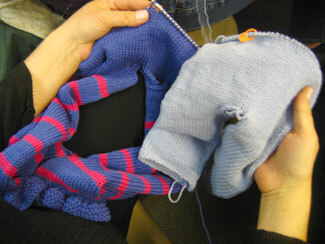 Johanna's working on a beautiful pair of mittens. 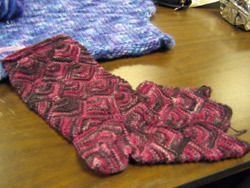 The pattern is a free online pattern called Bella's Mittens and the yarn is an almost variegated shade of Lamb's Pride. 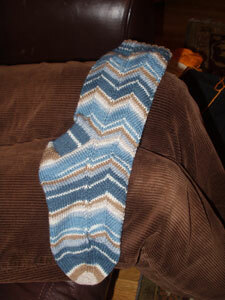 Johanna is making the most amazing socks! 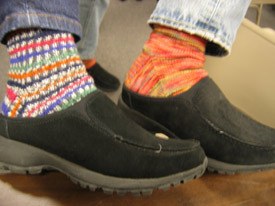 They're the "Hidden Passion" socks from Favorite Socks: 25 Timeless Designs from Interweave . 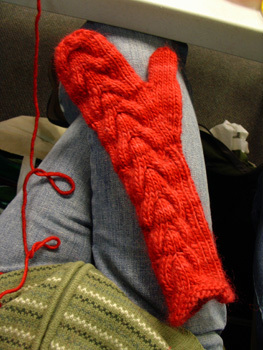 The shadow knitting technique reveals hugs and kisses (x's and o's) at the right angle. 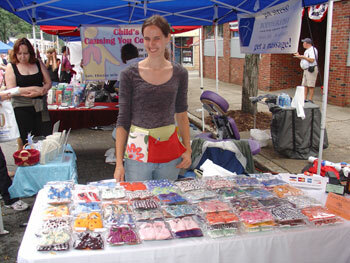 Two weeks ago some of us Knitsmiths went to visit Johanna's booth at the Victorian Fair there. 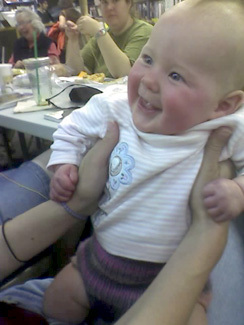 She was selling her cutie patootie baby shoes. 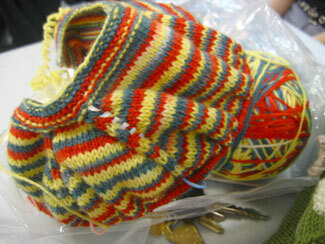 No knitting for Johanna this week - she was working on her adorable baby shoes for her etsy store. Check out the fun Halloween ones! 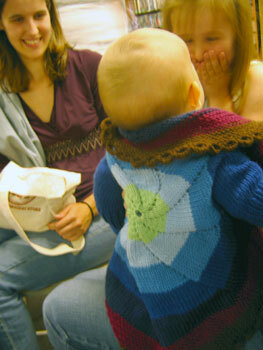 Johanna finished her baby pinwheel sweater for her daughter. 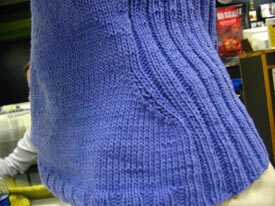 It's knitpicks swish - don't'cha just love all those blues?! 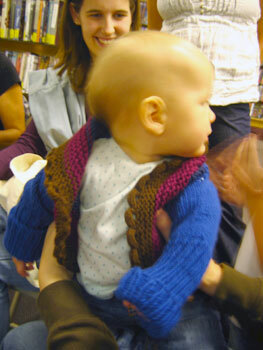 More pics of the beautiful sweater and baby on her blog. 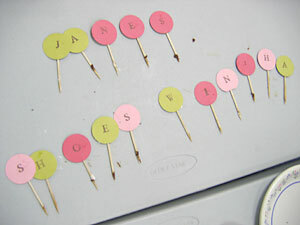 Johanna's mom visited us and brought this AMAZING project she's working on for her granddaughter. 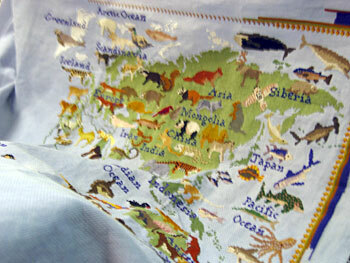 It's a map of the world with images of native animals in every region all in cross-stitch. Wow! 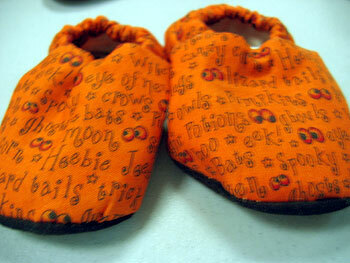 Who would have thought that wool soakers would look so cute on a baby's bottom? Johanna, of course! 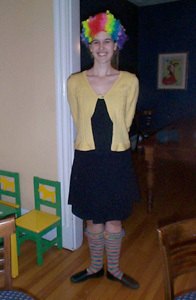 Johanna finished her IK cardigan! 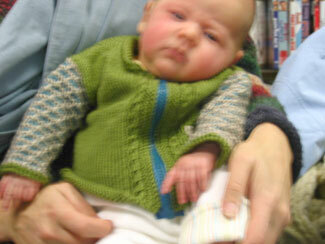 And now, here she is with baby Kaya in the sweater that Johanna's grossmutter knit and she used to wear as a baby. Awwww, Kaya is bored with us. 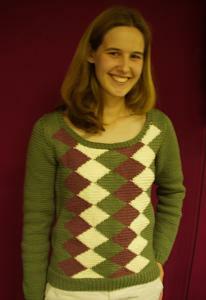 Johanna's finishing up the cover sweater from Winter's Interweave Knits. Just a zipper and it'll be all done! Kaya's showing off more of the cute handknits Johanna has made for her. This week she wore her sheep sweater. 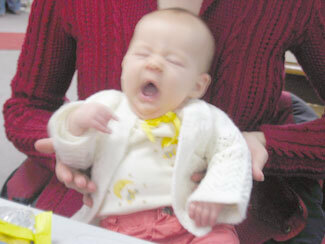 Johanna's little girl was modeling her Knitwhits Flore cap this week. It is soooo beautiful and in Rowan Cashsoft, it couldn't be softer! 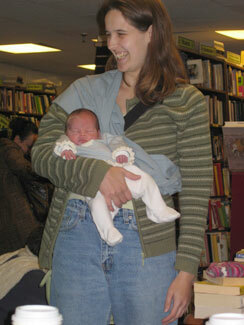 Johanna brought in two week old baby Kaya for a visit. Awwww. Looks like we had the shower just in time, because the very next day, Johanna had her baby! Baby is well and mommy is happy. Who could ask for more? I'm sure she'll be posting pics and details on her blog in a few days. 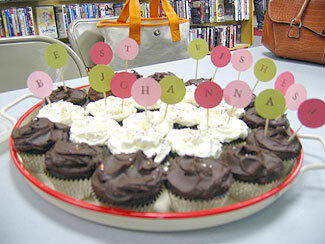 And this is why all the Knitsmiths showed up this week: Johanna's baby shower! Dina made the most fabulous cupcakes ever. 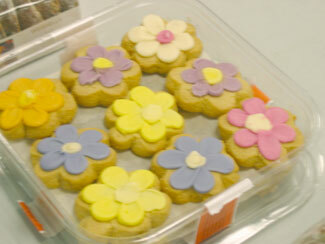 Kerstin brought pretty flower cookies. 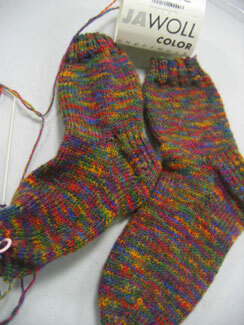 And she even finished some teensy tiny little socks for baby on the way. Awwwww! 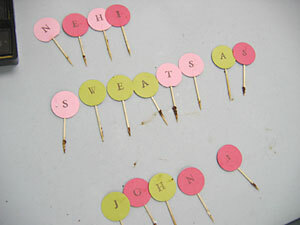 While Julia and I made funny sayings with the cupcake signs. 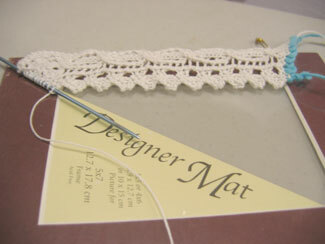 Johanna's working on a lace picture frame from Handknit Holidays. 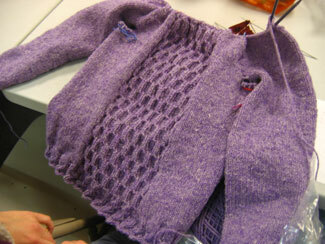 The Knitsmiths' first look at Johanna's finished Moonlight cardi - with two-way zip to make room for the baby belly! See ya at Rhinebeck! It's so adorable on her! 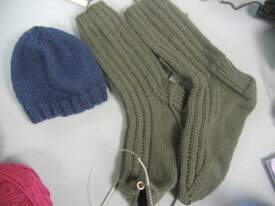 Both Lisa and Johanna are knitting pants! Lisa's making the fabulously funky ruffled pants from Bearfoot Knits for her daughter and Johanna knitted the baby cargo pants from Knitty.com. 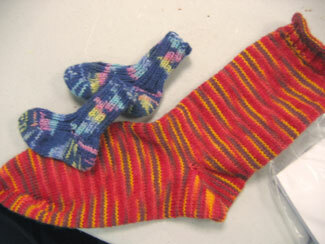 Johanna's been knitting little socks for one of her little friends. Soooo cute! 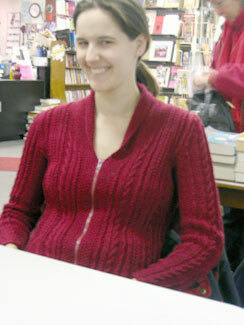 Johanna is loving this little top down raglan baby sweater knitted in Dani's first ever hand-dyed yarn! 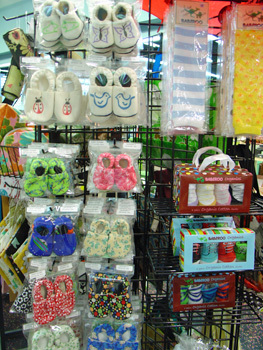 We can always count on Johanna to find the cutest baby knits! 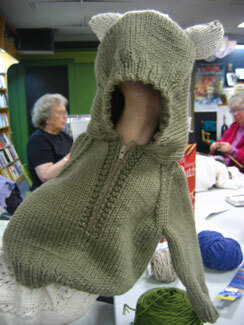 She's just finished this adorable Bouton D'Or pattern that has a hood with ears. Awwwww! And it's knit in Cashsoft, so it's super snuggly too. Just a purple sweater, indeed! You've outdone yourself Johanna! 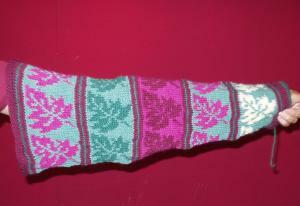 Johanna's also working on socks: moc croc socks for her hubby. And she's making serious progress on that purple sweater of hers. It's almost done! 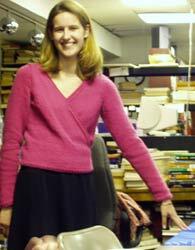 Johanna in her beautiful Huxley cardigan (Jaeger 38) in Aurora 8. Wow! 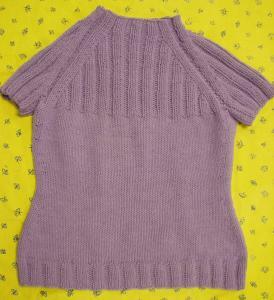 And her new project- another purple sweater which she described as "just a sweater". Yeah, right. 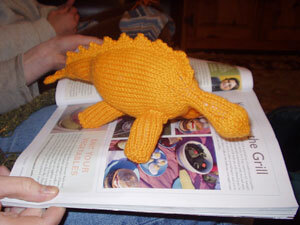 Look, Johanna just finished this cutie-patootie little orange dinosaur! 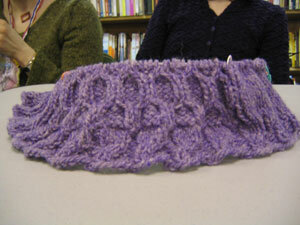 She says it only takes one ball of Rowan Handknit DK and the pattern is great! She's got three more dinos planned. 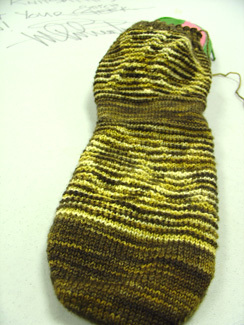 She's almost done with a fun pair of jaywalker socks in some cool self-striping Regia yarn. 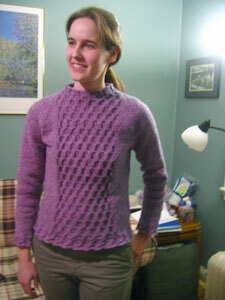 And just one more sleeve to set in and she'll finally be able to wear her gorgeous purple patterned Jaeger sweater. Ooooh, it's going to be so purty. Look at Johanna's fun beaded socks! 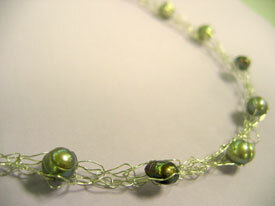 For her mother-in-law, Johanna knitted this beautiful pearl necklace! 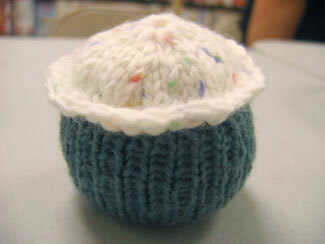 She's also knit a sweet little baby hat and is almost done with her super secret hubby socks. She just needs Trish to come through with her leftovers of the same yarn to finish off the socks and then she's all done! Johanna in her Halloween outfit (you probably can't see the candy corn earrings!) 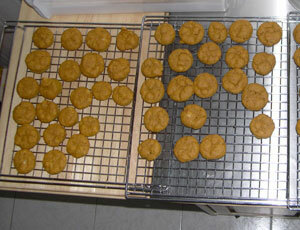 and her yummy pumpkin muffins. We've had a warm spell here and got to see one of Johanna's wonderful summer tanks. 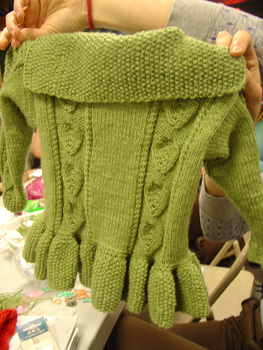 Look at how cleverly the waist shaping is done! 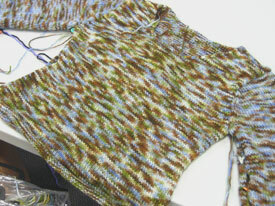 Her current project is this fabby t-shirt sweater in a new handpainted alpaca yarn called Atacama. Purty. 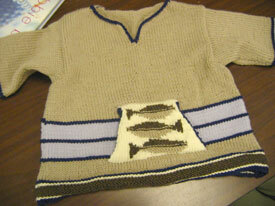 Johanna has just finished this super cute fishy sweater for a nephew, I think. The pattern is from a Bouton D'Or pattern book - they have such fun, unique patterns for kids! 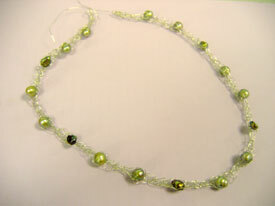 Look, she used beads for the little fishy eyes! Johanna is making the sweetest little bear out of Debbie Bliss' new Cashmerino Asktrakhan yarn. 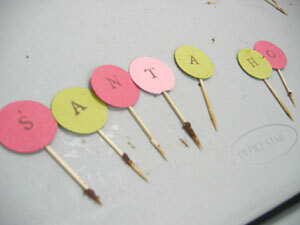 Ooooh, it's so cute. 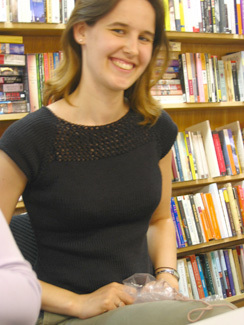 Johanna finished her Rebecca top just in time to wear on her trip to Mexico. She brought it in this week to model it for us. The big hit this week was watching Johanna try on the swingy, flingy Rebecca top she was finishing up to wear on her trip to Mexico. It's going to look great on her! 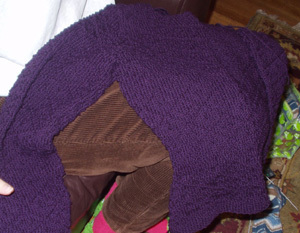 Terri just finished this stunning Jo Sharp shawl-collared, cabled cardigan. 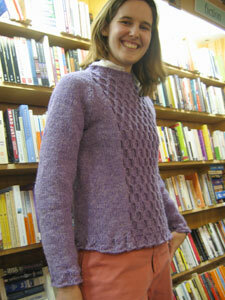 And Johanna's Debbie Bliss cotton angora ballerina wrap sweater is perfect for early spring. 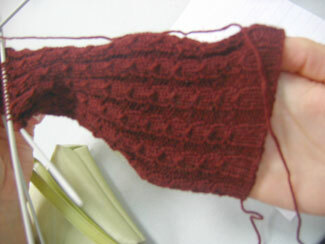 This week Johanna brought in her beautiful mitered sock to work on. 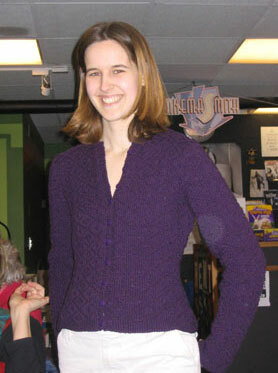 Johanna just finished her Jo Sharp ballerina wrap cardigan. 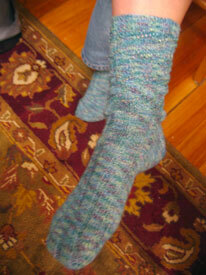 She used Debbie Bliss' cotton angora yarn and from listening to her while she was knitting, it was a real joy to make. It sure came out beautifully! And here's the body, almost finished! Look at that cool steek. That'll be fun to cut! 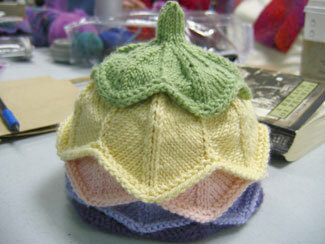 Johanna's new project is this beautiful leaf sweater from Poetry in Stitches. She's just finished the first sleeve. 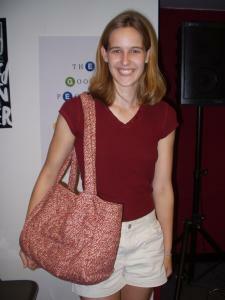 Johanna can also sew, and just made herself the neatest bag to carry her knitting in! 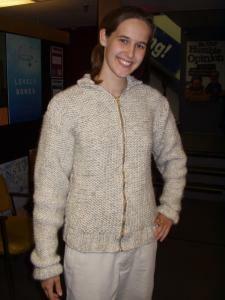 And a quick, bulky knit jacket in reverse stockinette (with zipper!). Somebody stop this girl! Awww! 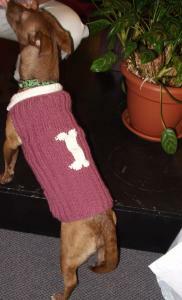 A dog sweater with a little bone on it made from leftovers from her first sweater. 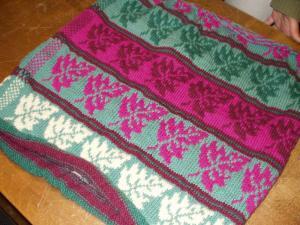 Finished almost simultaneously, Bob from Knitty in Lion Brand Cotton Ease. 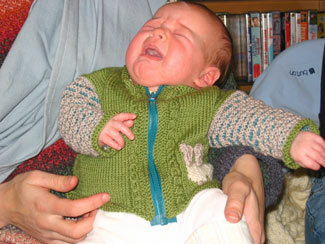 Johanna's first knitting project. 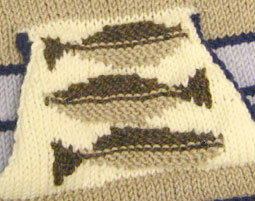 Not only does she start with a sweater, but intarsia. Very impressive.